The basic Drawing & Illustration class focuses on skills such as sketching, developing creativity, figure drawing, learning how to create proper perspective, charcoal pencil and inking techniques, and more. 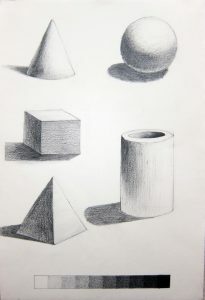 Students focus on what they like to draw, learning techniques and concepts that help them to refine and improve their skills, while learning about different artists and art genres. Because each student works at their own level, there is no need to “keep up” with other students. Additionally, students are pushed to try new concepts and techniques they may not be familiar with in order to foster their development as artists. Materials needed: A good Sketchbook, Drawing Pencils, and a grey Kneadable Artists Eraser. For drawing pencils, 2B or 4B are best for sketching and drawing. Recommended: The Art Supply Store on Central Avenue in St Petersburg, right up the street from the Morean. It is locally owned and operated by artists, and Members of the Morean receive 10% off.